Validate your JSON documents using our simple and free JSON Schema Draft 4 validation API. It's that simple. Try it out by copying the curl command into your terminal. 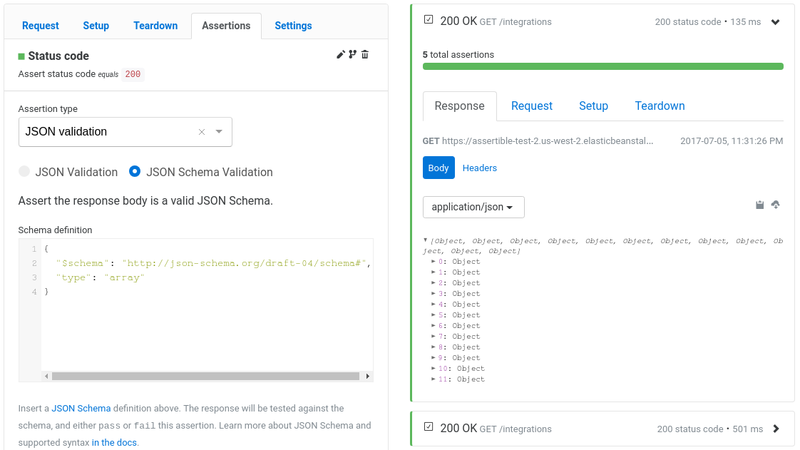 Assertible's free JSON Schema API is designed to be easy to use and flexible for a variety of use-cases. - `[1,2,3]` is not a string"
This API does not support external JSON Schema references. Please submit a chat or send us a message if this is required for your testing purposes. See the JSON Schema API documentation for more details. This JSON Schema Validation API falls under Assertible's terms of service and is intended for testing and exploratory purposes. We do not make any guarantees about the uptime and availability of the Free JSON Schema Validation API.